On a recent morning, nursing my perfect cup of coffee as brewed by my perfect host of a friend, I heard a sound from the kitchen. A shout, actually. I often see raccoons just after good light has receded. Contrary to popular notions, raccoons do forage in the daytime, especially mothers trying to feed their young. This mom was bold enough to afford me a few extra shots on my compact flash card. It’s a misnomer I often hear, that daylight raccoons are rabid raccoons. Not true. Raccoons in daytime combined with rabid-like behavior is another thing entirely. My friends love their once-a-year plum bloom. I can’t blame them: it’s short, precise. They’re compassionate to a fault and they’ve included these raccoons in their circle of kindness. They let a mama and her three babies den in an old covered boat in the backyard, a boat that now needs a remodel owing to bad raccoon housekeeping. The photo above shows mama teaching her babes to climb plum trees and eat just half the fruit before tossing it on the ground. In fairness, they were foraging the dropped plums, too. But the temptation, as they say, of low-lying and fresh fruit was too much for her. My friends overlook the mess in the boat as a gesture toward human-wildlife relations. The sweet plums are another. Everyone’s got a line. This is theirs. 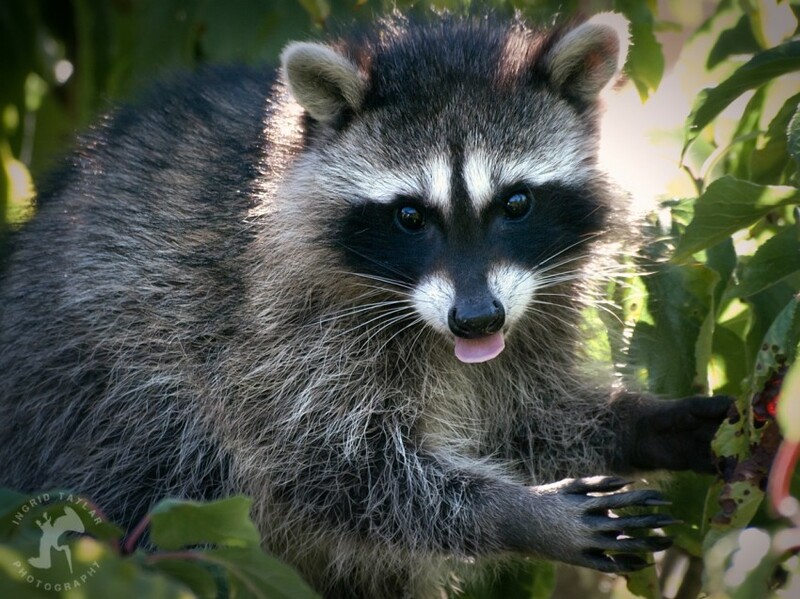 My friend pulled out her How to be Nice but Still Discourage Critters1 manual and flipped to raccoons — raccoons and fruit trees. There was a diagram of a metal baffle or metal wrap, the kind you see around LA to keep rats from nesting in the Beverly Hills palms. What can I say? She’s on to me. But . . . they’re not my plums. Huge distinction. So, we brainstormed on raccoon deterrents. Ultimately, we decided we didn’t want to set foot in Cabela’s and contribute to the coyote urine industry. So, we opted for the flashing solution. She’s been checking the tree but the raccoons seem to be baffled by the baffle. I did, however, catch the family in the way-back willow tree, where mama was teaching her young ones to navigate flimsy branches and forage for snails. It now appears to be a peaceful, Northwest coexistence.